If you want to start a self-hosted WordPress blog, one of the first steps you need to take is to purchase your domain name and web hosting. Unfortunately, selecting a web host can be very overwhelming for brand new bloggers as there are tons of web hosts to choose from and even more articles reviewing and recommending different web hosts. What’s a newbie to do?! Don’t worry, as a fellow blogger, I’ve got your back. SiteGround is the first web host Trevor (my husband) and I have used that we actually feel confident recommending to others. In fact, I trust SiteGround so much that I confidently call it the best web host for bloggers. Before I list out the 6 incredible reasons why SiteGround is the best web host for bloggers, I want to share a story about a time when I lost out on thousands of dollars in potential sales due to bad hosting. In the spring of 2010, Trevor and I started our first business together, A Good Time Photo Booth. That’s us pictured below in the first photobooth we built together. We were young, broke, and scrappy, which meant Trevor taught himself how to build our website and we used the cheapest web host we could find. We hustled to get everything ready for our first bridal show. Thankfully, the photobooth worked and it looked great, and more importantly, the wedding show was a huge success. We made three sales at the show and got a ton of leads from brides who visited our booth. As a vendor at the show, we also received a mailing list of the 11,000 brides who attended the wedding show. The next week, I crafted an awesome email directing those 11,000 brides to our website. I spent a long time perfecting that email and was proud (but also terrified) to hit send. About an hour after hitting the send button our website went down! All of those brides were opening their email, clicking on our link, and going to an error page! Sadly, we were brand new to managing a website and didn’t know any better. We had no idea the downtime was caused by crappy hosting. Since that disaster, we’ve used a variety of hosts and each time we’ve experienced multiple issues with our website. It didn’t matter if we were using the “bargain basement, no-name budget” web host, or the “most popular name on the market” web host – we experienced issues and downtime. Our pages would take forever to load or our site would go down for no apparent reason. Fast-forward 7 years and 3 hosting providers later, and we finally found a web host we love. The disastrous email story I told above is exactly why reliability is my number one criteria when selecting a hosting provider. I never want to experience downtime again when I’m in the middle of a big launch. SiteGround boasts 99.99% uptime and as of writing this post, we have had 100% uptime. I want you to imagine you just finished an epic blog post. …your site goes down for 24 hours. Your promotion strategies generate tons of clicks, but they all land on a dead site! As a blogger, you can’t afford for that to happen, which is why SiteGround is ideal. SiteGround lists out five technological advances that contribute to their awesome uptime. If you’re like me, you don’t completely understand what all of that means, but trust me when I say it works! If you want to read more about the technology behind StieGrounds 99.99% uptime click here. We have been blown away by the customer service and tech support we receive from SiteGround. When Trevor was looking into switching our web host, he was on LiveChat with our old host and SiteGround at the same time. SiteGround answered all of our questions within 10 minutes. After spending 40 minutes on LiveChat with our old host, Trevor still had no answer and closed the chat session. That experience is what sold Trevor on SiteGround and convinced him to make the switch. His number one criteria when selecting a hosting provider is how quickly they respond to questions and issues. He’s learned over the years that technology is unpredictable and things occasionally break. That’s why it’s so important to have technology partners you can trust to respond quickly and help you fix issues fast. SiteGround also has legitimate 24-hour online chat support. I say legitimate because Trevor learned the hard way when one of our old hosting providers claimed they had 24-hour support. Turns out their definition of support was knowledge base articles and they didn’t respond to emails for 24-72 hours. I don’t know about you, but in my book, self-service knowledge base articles do not constitute 24-hour support! Another incredible reason why SiteGround is the best web host for bloggers is the load time. Load time refers to how quickly your web pages load. Slow load times cause readers to bounce from your site and move on to the next site. Higher bounce rates mean fewer page views and fewer users. If you want to grow a profitable blog, you need a speedy website with fast load times! SiteGround employs multiple speed technologies to ensure fast load times. Personally, I don’t have a clue what all of that means. I leave the nerdy tech stuff to Trevor. …before we switched to SiteGround, my homepage took forever to load (if at all). Trevor fiddled with every plugin and deleted everything down to bare bones. Finally, after much prodding from me, he agreed to switch hosts. We had both heard great things about SiteGround and after Trevor’s experience with their customer service, we decided to give it a go. Can you guess what happened to my homepage after we switched? It loaded perfectly fine in about one second! Problem solved. All that time and energy spent troubleshooting and it was the web host all along! SiteGround hosting plans (even the beginning start-up plan) come with tons of free add-ons. The free SLL certificate is a big deal and worth a lot of money! Your SSL will encrypt all data transmitted to and from other websites and programs. Once your SSL certificate is installed, your website will be an https instead of an http. In some browsers, you’ll also see a green lock and the word “Secure” next to your domain name. SiteGround gives a free SSL Certificate or Wildcard SSL Certificate through Let’s Encrypt. The Wildcard SSL allows one certificate for your domain and all subdomains, which means you can protect unlimited subdomains. For example, courses.angiegensler.com is a subdomain of angiegensler.com. The Wildcard certificate alone is worth about $300 – 400 a year! 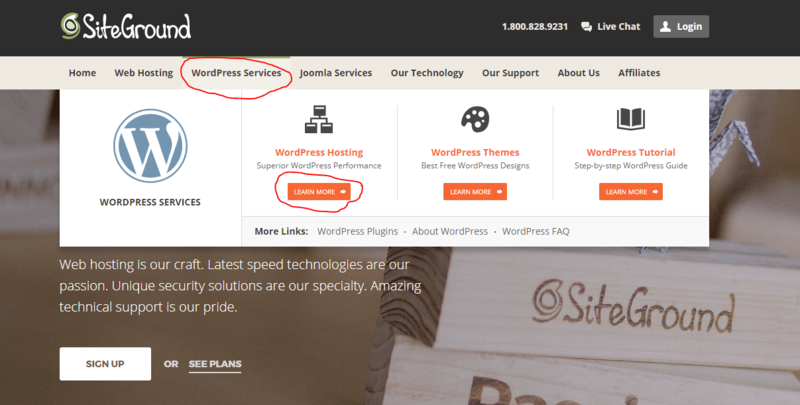 SiteGround has hosting plans specific for WordPress websites. These plans boast improved site speed, security, and support for WordPress websites. SiteGround understands the many issues that can arise with managing a website and their team goes above and beyond to help troubleshoot WordPress issues, even if it’s a non-hosting related issue. Plus, SiteGround will automatically update your WordPress when needed and the WP-CLI interface makes installing and updating themes and plugins easier. In regards to speed, SiteGround has their own caching tool, the SuperCacher, which uses some fancy technology I don’t understand, but I do know it increases the speed of my WordPress site and that’s all I care about! 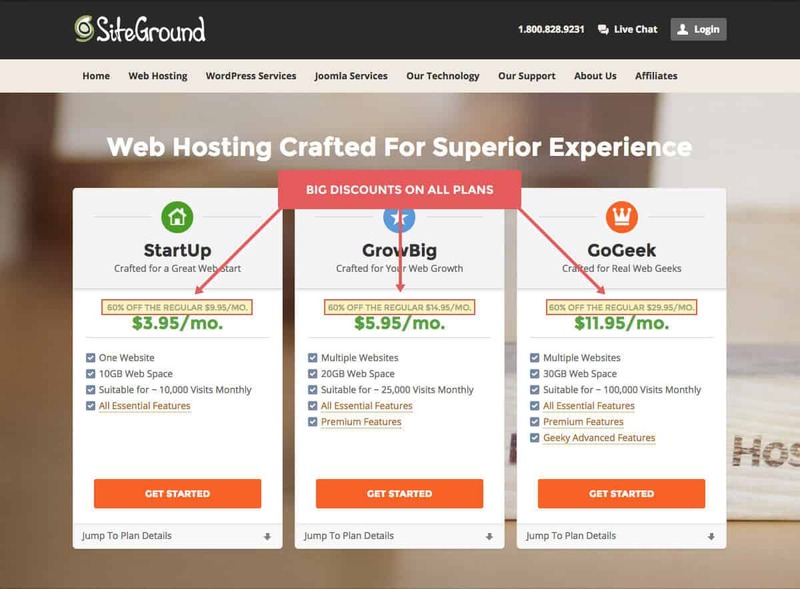 SiteGround is priced right in line with other well-known web hosts, which makes them an amazing deal when you factor the additional value they provide. New customers get 60% off the regular price for their first term and you can select a term up to 36 months at that initial 60% off price. The start-up plan starts at less than $4 per month and it includes everything a new blogger needs, and then some. As your blog grows, you can increase your hosting plan to grow with it and accommodate your needs. SiteGround also offers a 30-day money back guarantee. This gives you the peace of mind to choose SiteGround and if you’re not happy with the speed, uptime, and service, you can request your money back within 30 days. Click here to read their full refund policy. If those 6 incredible reasons why SiteGround is the best web host for bloggers convinced you to sign up with SiteGround, here’s step-by-step instructions to get you started. 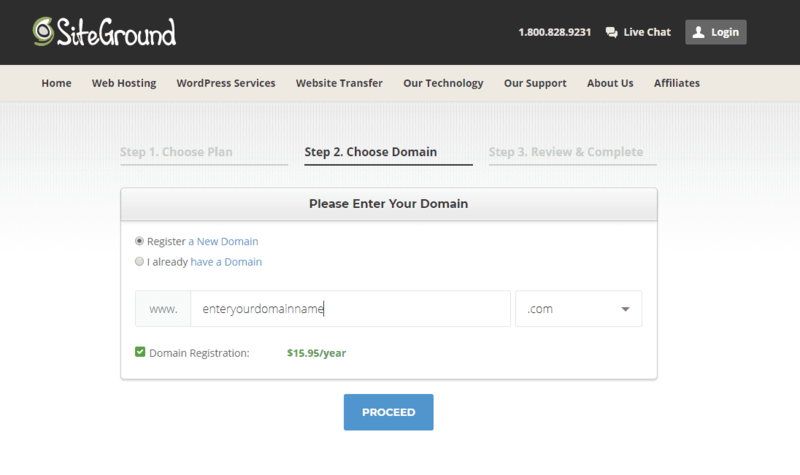 You can also purchase your domain through namecheap.com and save $5 – $8. However, doing this delays the process because you may have to wait 24 – 48 hours for the nameservers to point to your hosting. It also creates another technical step in the process. 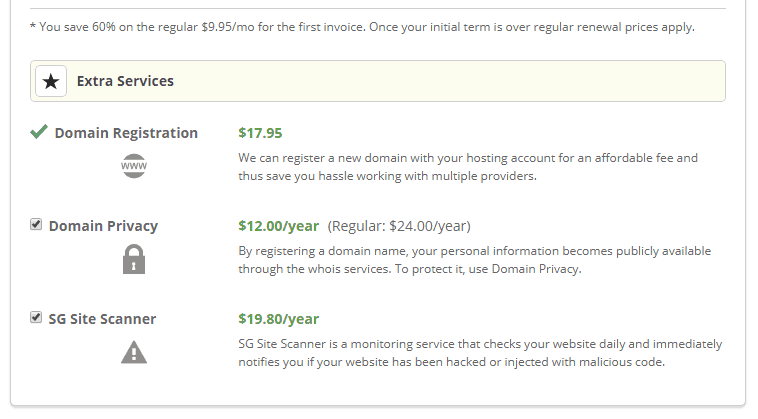 For this reason, we recommend purchasing your domain name through SiteGround. It keeps things simple. Once you’ve selected an available domain name, you’ll be directed to a form to collect your personal and payment information. The bottom of this form includes extra services. Unless you need an additional layer of privacy and security, you can uncheck those options. Once you’ve filled out your personal information and completed the transaction, you’re ready to get everything set up! If you’re starting a brand new blog, be sure to fill out the form below to download my free ebook: The Non-Techies Guide to How to Start a Blog and check out Easy Blog in a Box for help with the technical setup and design of your blog. If you found this post helpful please share it with others and let me know in the comments below. I’d love to hear from you!